Launched on July 31, 2017, the Jeep Compass is priced between Rs 15.40 lakh and 22.90 lakh (ex-showroom, New Delhi). Its prices increased by upto Rs 72,000 post the increase in cess over GST w.e.f. September 9, 2017, though if you are planning to buy one they are still quite attractive. The Compass is available in four trim levels – Sport (base), Longitude and the range-topping Limited. There are three more optional trims as well, based on the top two variants – Longitude (O) and Limited (O). In all, there are 13 variants to choose from, including the 4x4 variant which is available only in the top-end diesel spec. If you fancy buying the petrol Compass, the 1.4-litre MultiAir II turbocharged petrol engine is available only with the base-spec Sport and top-spec Limited 4x2 variants. The base petrol Sport trim can only be had with a 6-speed manual transmission, while the top-spec Limited petrol trims are only available with a 7-speed dual-clutch automatic. The diesel doesn’t offer an automatic option yet. However, the diesel auto (9-speed auto) is expected to be launched in the first half of 2019. Only the diesel-powered Compass gets the 4x4 option in the top-spec Limited, Limited (O) and Limited (Plus) trims. The base Jeep Compass Sport is priced very aggressively in the mid-sized SUV space. If you’re on a budget and want to join the Jeep bandwagon, this is the variant for you. The Sport trim doesn't skimp on safety either and offers almost all of the Compass' safety features, including ESC and TCS! 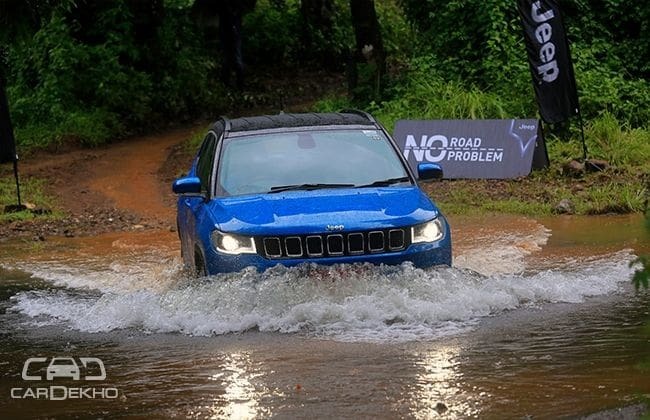 But Jeep has missed out on some essentials such as rear-parking sensors and the AC is manual, which is disappointing for a car that’s priced over Rs 15 lakh. On the infotainment front, Jeep offers a 5-inch touchscreen in its base trim. It’s the same as in other markets but doesn’t offer support for Android Auto or Apple CarPlay. Longitude (O) additionally offers Uconnect 7.0 featuring a 7-inch touchscreen with Apple CarPlay and Android Auto support along with controls for the dual-zone climate control system (with activated carbon filter). Also offered are projector headlamps and black roof rails. The Longitude ups the premium quotient while the Longitude (O) enhances the experience further with the addition of a 7-inch Uconnect touchscreen with support for CarPlay and Android Auto. Dual-zone climate control has also been added along with projector headlamps in the Limited (O). In our books, the Longitude (O) is the Compass to go for if you want this SUV. Sadly, both the Longitude and the Longitude (O) are not offered with a petrol option which makes the about Rs 2 lakh premium over the Sport variant quite steep. Hands down, the Limited trim offers the widest choice of engine and drivetrain options. It is the only variant that offers an automatic option – a 7-speed dual-clutch auto with the 1.4-litre turbo petrol. Also, only in this variant you get a 4x4 option with a 2.0-litre diesel/6-speed manual transmission. So, if you wish to go off-roading, the Limited/Limited (O)/ Limited Plus diesel 4x4 is a no-brainer. Besides, it’s the only variant to offer six airbags. Panoramic sunroof: This is the only variant that gets one, in case a sunroof ranks high on your must have list. Auto headlamps with bigger 18-inch dual-tone alloy wheels. Instead of the 7-inch touchscreen, you get the bigger 8.4-inch Uconnect touchscreen with Apple CarPlay and Android Auto. If you are eyeing the Jeep Compass and were already stretching your budget for the Limited (O), then why not add almost Rs 1 lakh more for this top-spec model? It would not affect the EMIs drastically either. Moreover, with a sunroof, bigger touchscreen and some more convenience features, it even justifies the premium you pay. If you fancy your Compass to look different from the others, then there are special editions called the Bedrock and the Black Pack.